The Casio AP 420 Celviano Digital Piano is a unique music playing system that has been introduced in the market with the latest technology and features. It is exclusively targeted for those users who specifically look for sophistication and authenticity in piano systems. 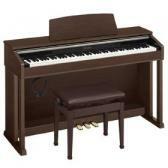 We found Amazon.com to have the best prices on the Casio AP420 Celviano Digital Piano. Click here to check it out. The new AP-420’s conventional design has new stereo grand piano sounds and improved “Ivory Touch” keyboard. The product utilizes a new tri-sensor spring-less 88 note scaled hammer action which helps in capturing every nuance and detail of the user’s performance. With the inclusion of a new 4 layer stereo grand piano feature, Casio AP 420 Celviano delivers a natural, expressive and energetic piano experience. SAVE 36% with Free Shipping on Amazon Now! The Casio AP-420 comprises of a maximum of 16 built-in tones, with the capacity to level two sounds or divide the keyboard to allow a bass sound in the left hand. It has built-in SD card slot that enables the user to load and save song files and the addition of dual 20W speaker system delivers a sound that resonates through the surrounding area. With features like 128 notes of polyphony, USB MIDI, Duet Mode, 1/4” audio outputs and more, Celviano’s superior know-how of a piano’s working makes the AP-420 the perfect addition to any home. What makes this model of Casio digital piano stand apart from other pianos is that it is one of the exclusive high-tech and high-end digital pianos which has newly developed sound source technology known as the Linear Morphing AiF that offers the complete spectrum of genuine striking piano tones from Pianissimo to Fortissimo without hasty changes to the sound during the transitions. Special consideration and work has been devoted on the part of the developers to make sure that the touch and note replay performance for the scaled hammer action keyboards improves drastically. The new “Tri-Sensor” concept makes even the most fused and difficult playing techniques possible. This new product is already available for sale in select countries and can be ordered and shipped anytime. Customer reviews for this product has been exceptionally positive and going by the popular feeling, Casio AP420 digital piano can certainly be regarded as one of the best pianos in the market. Many of the reviewers have liked the cabinet of the AP420, sliding keyboard cover, and also the front legs of the piano, which funnily makes it look less like a keyboard and more like an tangible piece of furniture. Those who are looking to upgrade their digital piano to something that has graded hammer action, and which would look nice in their living rooms, can certainly buy this product as it has the advantage of sounding as close to an acoustic piano as possible. Click here to read more reviews on Amazon. The price of the product is reasonable considering the fact that Celviano Ap420 has some really great features. So spending around a thousand bucks or little more wouldn’t be a much of a hindrance for the music lovers. However, some users also gave negative views on the product. Like for example one of them said that the system’s music stand is not hinged but has two pins that are inserted into holes in the top of the piano. The music, according to some other reviewers feels powerful enough, but the way it attaches seemed to be a mixture of some kind of cheap. Though, up to some point it may be a problem, but in the larger scheme of positives this problem is certainly very minor and proves to be of no hindrance at all. The reviewers themselves were rather quick to admit that the overall piano sounds were quite good, though they were expecting it to be much better. We certainly put our thumbs up for this unique product and would definitely advise consumers to go for it. It is fully usable for beginners and can be simply assembled without much fuss. Yep! Casio AP420 Celviano digital piano is the perfect system to get you grooving to the tunes of your favorite music. Click here to check it out and save $500 on Amazon. How would you rate the "Casio AP420 Celviano Digital Piano"?